The Hong Kong Trade Development Council (HKTDC) led four leading Hong Kong design labels to unveil their 2019 Autumn/Winter collections at London Fashion Week, showcasing Hong Kong's fashion creativity to industry elites and style influencers from around the world. The HKTDC featured the four labels at its "Fashion Hong Kong" Fashion Presentation and Cocktail Reception on 15 Feb at The College, Old Central Saint Martins in London. The event attracted more than 850 buyers, media representatives and fashionistas. This is the second year for Fashion Hong Kong to take the city's brands to London Fashion Week. The event fostered an exchange among fashion industry experts from the two places and was well received by scores of industry experts and celebrities, including Caroline Rush, CEO of the British Fashion Council, fashion DJ Siobhan Bell, UK model Bee Beardsworth, and Izzy B Philips from rock band Black Honey. International fashion media and local fashion influencers including The Business of Fashion (BoF), Women's Wear Daily (WWD) and ELLE UK attended and reported on the event. The HKTDC took four Hong Kong fashion brands - Doris Kath Chan (brand name: DORISKATH), Cynthia Mak (brand name: HOUSE OF V), Polly Ho (brand name: LOOM LOOP) and Yeung Chin (brand name: YEUNG CHIN) - to launch their 2019 Autumn/Winter collections at London Fashion Week on 15 Feb. 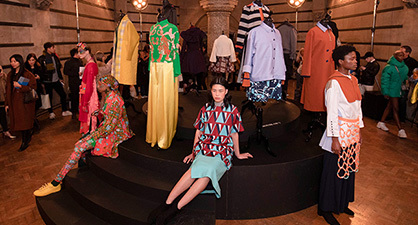 The Fashion Hong Kong Fashion Presentation and Cocktail Reception was held at Old Central Saint Martins in London, attracting more than 850 buyers, media representatives and fashionistas. The four Hong Kong fashion designers presented the cutting-edge of the city's fashion creativity by incorporating art installations, music, drama and performance art elements into the presentation. Each showcased their own unique style and together they highlighted the multi-faceted and diverse talent of Hong Kong designers. Showcasing their designs were Doris Kath Chan (brand name: DORISKATH), Cynthia Mak (brand name: HOUSE OF V), Polly Ho (brand name: LOOM LOOP) and Yeung Chin (brand name: YEUNG CHIN). Fashion Hong Kong is a series of international promotional events organised by the Hong Kong Trade Development Council (HKTDC) to promote Hong Kong fashion designers and labels in the global fashion arena. Since 2015, Fashion Hong Kong has actively participated in international fashion weeks and renowned events - in cities such as New York, London, Copenhagen, Tokyo and Shanghai - to showcase Hong Kong's unique and diversified designs. The HKTDC led three Hong Kong designer brands to feature at New York Fashion Week on 8 Feb. The Fashion Hong Kong event during London Fashion Week received support from StoryTeller, Shirtstylist.com, PERKS, Daycraft, Chocolat-ier, Antalis and DHL Express. A graduate of Central Saint Martins College of Arts and Design in London, Doris Kath Chan's work has been well received by international media and celebrities for her simple yet elegant design style and signature multiple-wear design. "M.E." is inspired by the "mirror stage" concept developed by the French psychologist Jacques Lacan. It is an elaboration of the contrast between this imaginary projection and the real self, beautifully combining both feminine and masculine design elements. Cynthia Mak graduated with distinction from Central Saint Martins College of Arts and Design in London. Her final-year collection garnered praise from Vogue Italy, which called her one of the "New Talents" to watch out for. Award-winning designer Polly Ho established LOOM LOOP after a Guangdong trip on which she discovered an extant fabric, "Canton Silk". Polly has been honoured with the Design for Asia Award 2015 (Bronze), Perspective magazine's 40 under 40 Award, and the HKDA Global Design Awards (Silver and Hong Kong Best) in 2016. 2019 A/W Collection: "Concrete Jungle"
"Concrete Jungle" is inspired by a unique Chinese symbol, the tiger, which often features in traditional Chinese architecture in Hong Kong. The collection interprets Hong Kong's unique cultural fusion of East and West and ancient and modern with a colourful mix of tiger prints and fabrics as well as a sophisticated layering with accessories. The collection received support from renowned millinery brand Misa Harada which tailored its tiger print fabrics. Yeung Chin obtained his masters in Fashion Design from the University of Westminster in London. He won a Special Mention Award at the 2003 Hong Kong Young Fashion Designers' Contest (YDC) and went on to establish YEUNG CHIN in 2013.2019 A/W Collection: "Utopia"
"Utopia" is inspired by controversial scenes in two military movies - the 1974 Italian psychodrama The Night Porter and 2018 American spy thriller Red Sparrow. The collection readdresses the military inspiration with the brand's signature boyish, asymmetric and layered silhouettes. By incorporating art elements such as music, drama and illustration, as well as engaging a group of character models, the presentation showcases the unique tension in Yeung Chin's designs.